SID Exhibitor Design Hunter Q+..
Amber Ward and Adam Cruickshank seemed destined to meet. And finally they did, to form a private and professional relationship of rich creativity. By Anna Flanders. Above: Amber and Adam share a laugh over the ottoman design pinned to their kitchen wall. It may sound corny, but you get the feeling Perth-based designer-makers Adam Cruickshank and Amber Ward were meant to come together. Both were born to Maltese mothers in the same area of New South Wales. Both were inquisitive with materials and ‘crafted works’ from just past toddler age. Both cite the world around them as their source of inspiration. However, the couple were separated by distance in childhood and didn’t meet until their thirties when they were both guest presenters at a mid-2010 Design Institute of Australia event in Western Australia. At a young age, Adam’s naval-officer father took his family around the world to the United States, Germany, the United Kingdom and most states along the eastern seaboard of Australia, while Amber’s family stayed put. Today, both credit their creativity to their experiences. Adam points to travel and his parents’ love of museums and art galleries as inspiring his design. Amber, feeling displaced in suburbia, became insular, retreating to her thoughts and developing a thirst for the knowledge and research which informs how she works today. 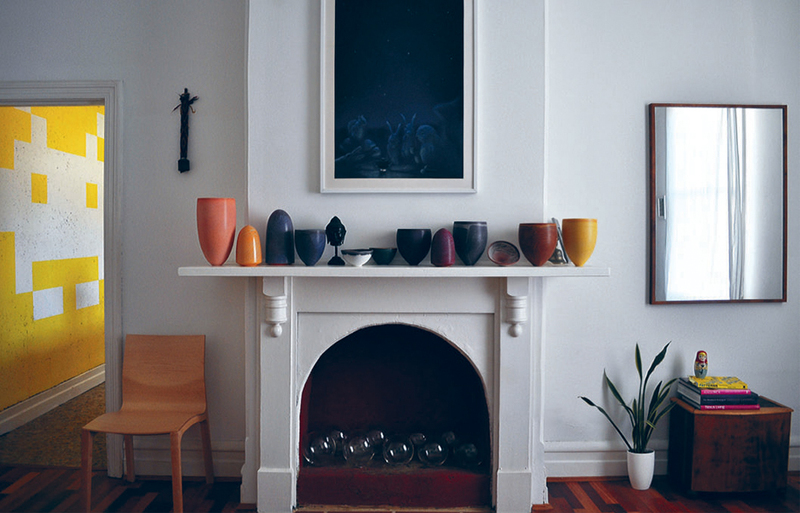 The living room’s Pippin Drysdale ceramics under a Linus Andersson artwork. Left, a prototype chair by Adam. 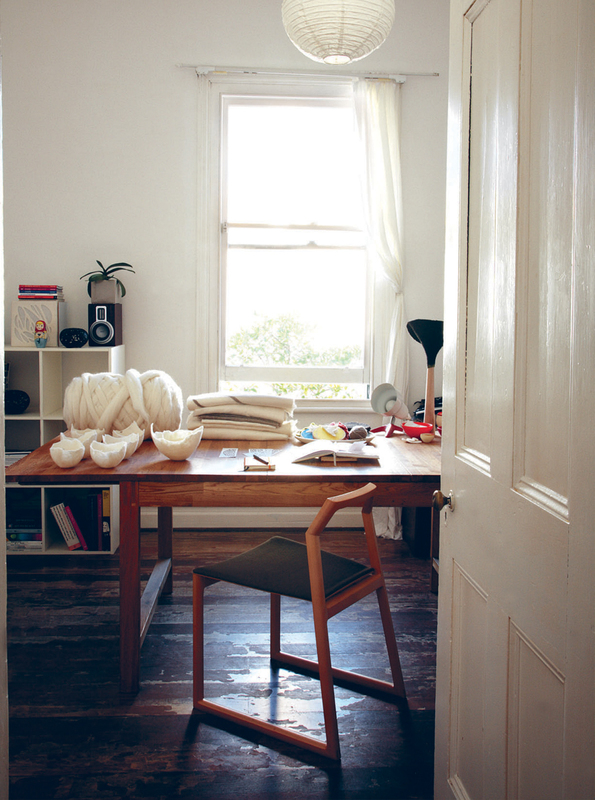 Today, the pair live in a cottage in the city of Fremantle in Western Australia (WA), where Amber works from home in her two studios as Kietsu Studios, and Adam under his own name as part of the designer-maker team at Midland Atelier, which is an initiative created through WA design body FORM, a not-for-profit organisation supporting the creative industries in the state. They work in different media – Adam is renowned for his work with wood, and Amber for hers with alpaca and wool felting and EchoPanel screens, themselves produced from approximately 60 per cent recycled PET bottles – but both studied design and across disciplines. They run independent businesses, but are increasingly coming together, with recent lighting, seating and kitchen collaborations. 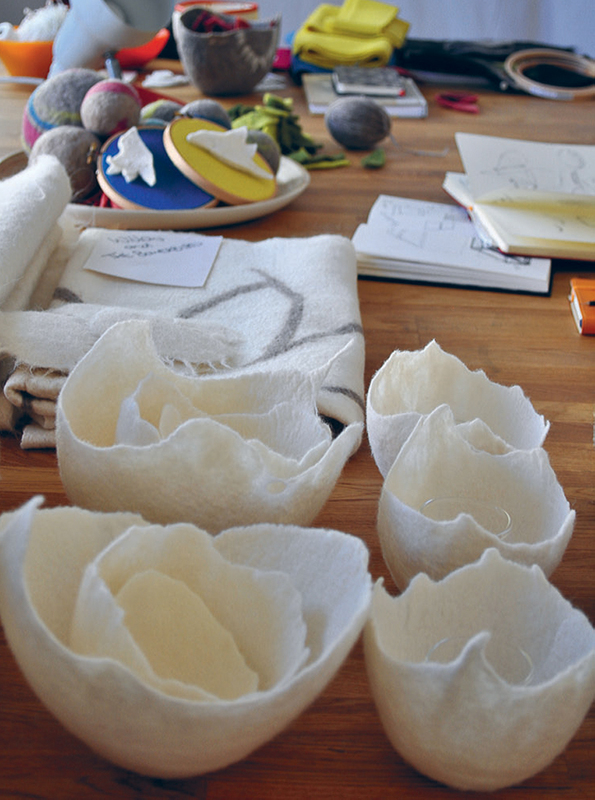 Amber’s studio features commissioned felt. works and Adam’s Stream dining chair. “I think we both inherently like working independently, but [it is easy for us to] work together. We come up with a concept, then one of us will make up a model, then we’ll talk about it and refine and change it. One of us will take over a part of it at this stage. Although we both studied design, we have different training, so the person who [is best at the skill most] needed then takes the lead,” Amber says. The couple’s ability to work without ego and with acknowledgement and respect comes through loud and clear. “Our skills complement each other. Amber is great on the research side and I am good on the technical front. There will be some good collaboration projects coming about,” Adam says. And while they respond to shared inspirations in very different ways, there are similarities in their overall aesthetic. Detail of Amber’s commissioned work for retail clients, including Habitat Votive bowls. “In probably many ways, we are quite opposing personalities, but when it comes to aesthetics, function and form – and those important things that are key to design – we both see things so similarly. When we first started working together, Adam would be talking about something and I would open my diary of a table or light that I had drawn and he would say ‘my God, that is the form I am talking about’. “So, that synergy was there from the beginning. And we never really have major clashes on what we think will be the right solution for a finish or a form,” Amber says. Their aesthetics are somewhat timeless – although time itself may determine how true that statement is. Both work in traditional materials – Adam in timber, Amber in felting. Each has an organic element to their work, with Adam’s a minimal look and Amber’s a holistic sustainable, ethical and environmental approach. 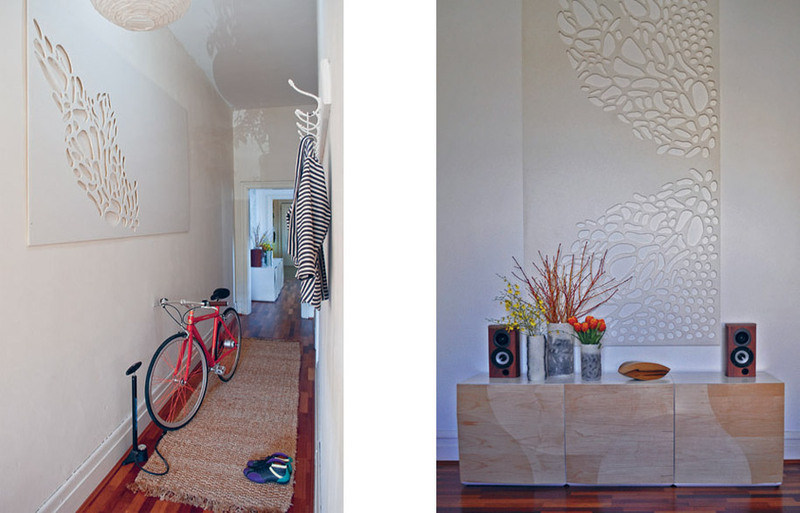 Left: The hallway displays a Symbiosis IV EchoPanel wall-mounted screen. Right: The living room features Adam’s Desert Cubes cabinet, felted glass vessels by Amber and a Symbiosis I handsculpted EchoPanel wall-mounted screen. chooses to work in mostly black and white, and the shades in between, used sparingly and cleverly, thanks to her ceramics and colour training under renowned Australian ceramicist, Pippin Drysdale. Adam adds colour only when necessary, preferring the natural tones of timber. Walking about their home, you find there is a synergy between their individual works. 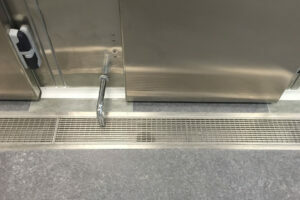 One point of difference, however, is the way in which they approach sustainable practices. Amber credits her mother with instilling her with an understanding of ‘natural is best’, while her “inner research nerd” has honed that knowledge into an overarching, sustainable approach to her alpaca and non-mulesed wool felting and the use of EchoPanel. It’s a philosophy that sees beauty in not only aesthetics, but also deeper environmental, social and ethical impacts, from farm to finished form. 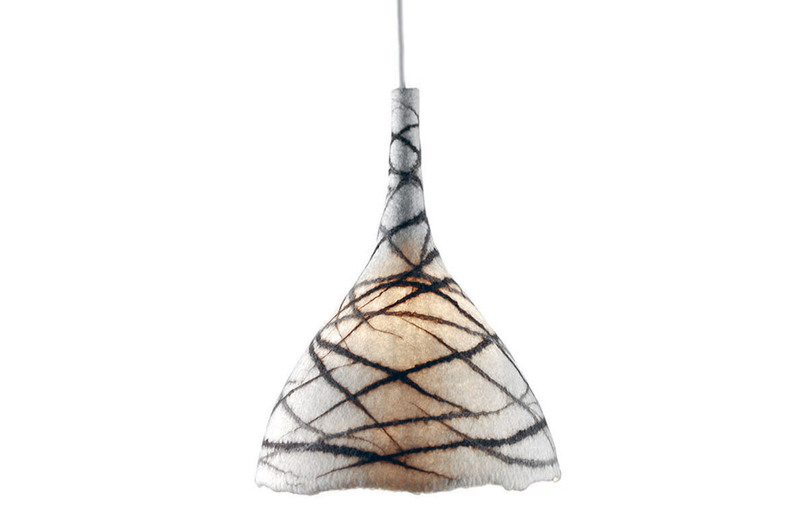 The Cruickshank + Kietsu Willow Mini Pendant Light in handmade wool felt using non-mulesed Western Australian merino wool. “I guess that’s where the notion of merging art and design comes together – there is a concept behind the form. 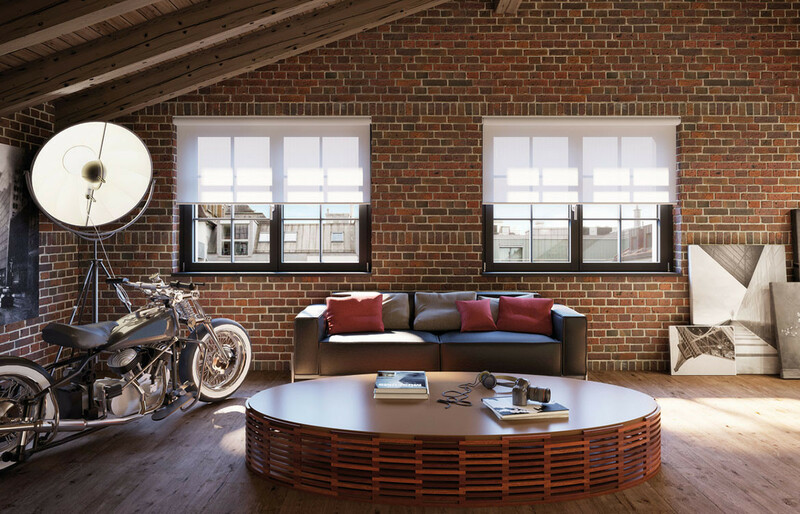 Because there is so much surface emphasis in one aspect of design, sometimes we underestimate the depth it can be looked at but still serve to function,” she says. On the other hand, Adam has developed techniques to minimise waste and his own impacts on the world. He cites Amber’s dedication and New Zealand furniture designer-maker David Trubridge’s approach as having a strong influence on his work. “I keep saying to myself that [sustainability] will be a bigger driver for my own work, but I seem to be driven by other things at the moment. It is a matter of stopping, testing and developing processes. There are alternatives I would like to explore,” Adam says. 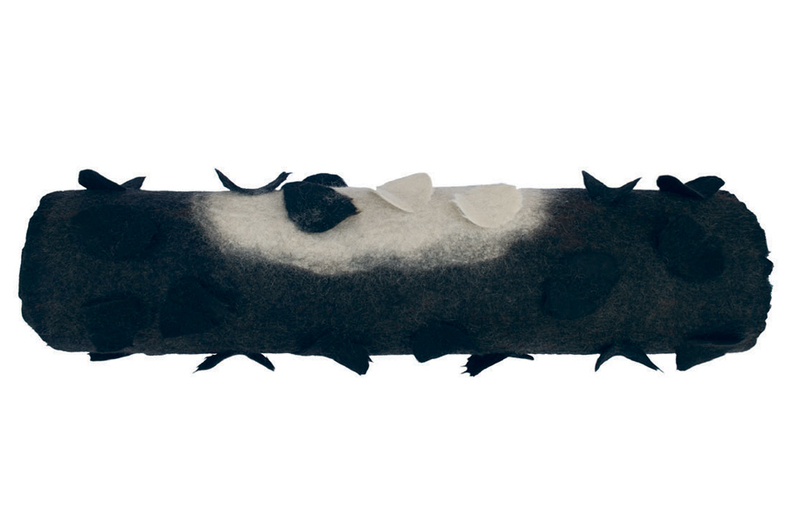 A Midnight Pool rug from Amber’s Fallen Series I, handmade felt using alpaca and merino, as above. Adam has just returned from a jaunt in the desert with David Trubridge and fellow Midland Atelier designer-maker Nick Statham to prepare for an exhibition of the trio’s work mid-2012. He will no doubt be pushing boundaries in those prototypes. Meanwhile, Amber is planning a trip to Tasmania, which will be the catalyst for her own proposed exhibition next year. They are also fulfilling an increasing body of commissions, both individually and as a couple. Left: Adam’s Desert Cubes cabinetry in Maple. 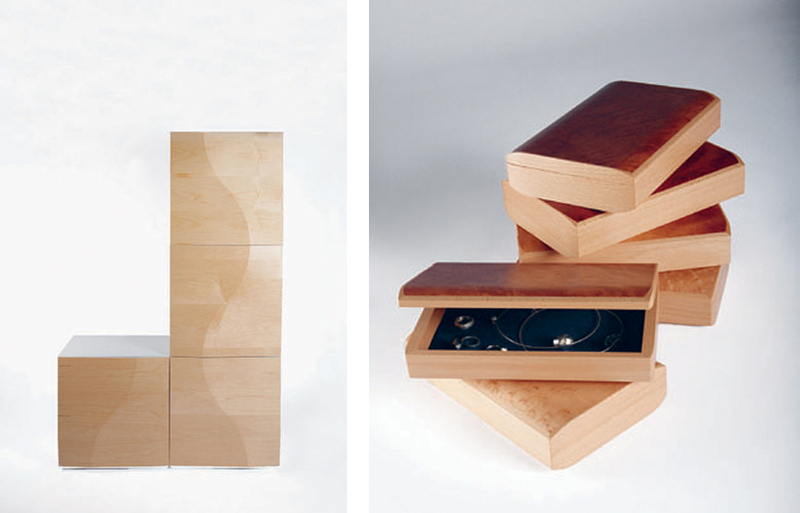 Right: Jewellery boxes handcrafted by Adam in European Beech, Madrona, Maple and Myrtle. So, how do two creatives live and work – separately and collaboratively – in the one house? “We are both obsessed with our work,” Adam says. “Amber is so driven and has always been into creating with her own hands. It is how I feel about my work. “It’s great to work with someone who also has that drive. We can understand each other and accept we are both obsessed with what we are doing and give each other space and respect that. There is support, too,” he says. “And you know when the other person just really needs to push through – if one of us has to do something, the other one doesn’t try to interfere with that – but you also know when you need to say ‘you need a day off’, and you know when they can have that day off,” Amber adds. 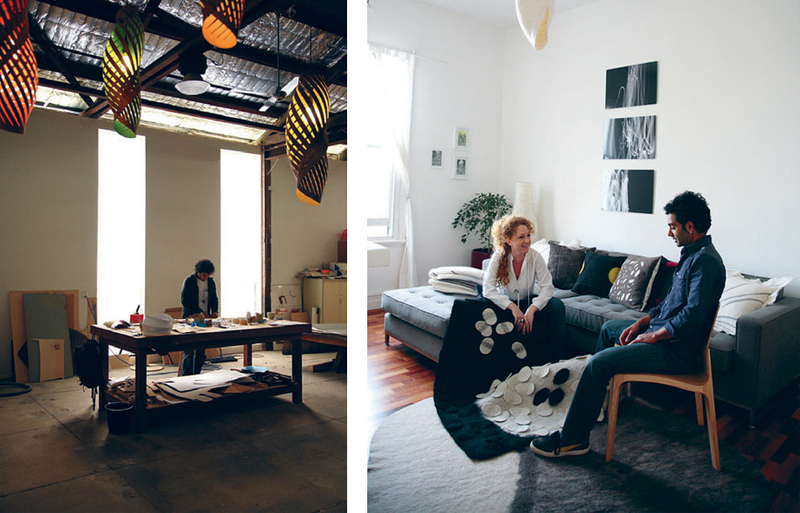 Right: Amber and Adam discuss Amber’s Midnight Rock Pool rug from her Fallen Series I. With these two creatives living and working together, it will be interesting to see how their collaborative aesthetic evolves. Both have an eye on the industry, both have enormous drive and both live and breathe design. However, above all, they both also have huge respect for each other’s skills. 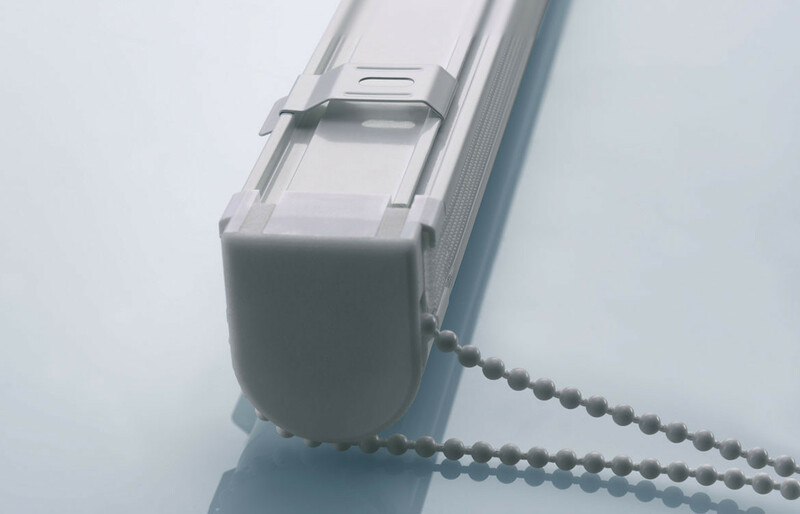 With the Willow Light just emerging on the retail market and more projects coming out of prototype stages, this is definitely a union to watch.